RoyalEnfields.com: What does this bicycle tell Royal Enfield about design? What does this bicycle tell Royal Enfield about design? This 1960s bicycle is a study in straight lines, circles and curves. 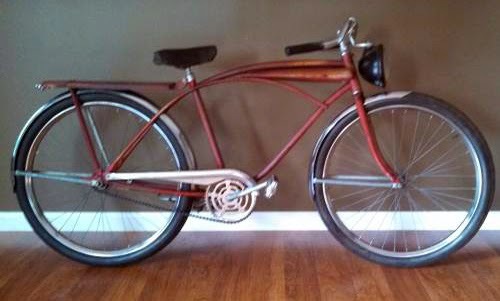 It's not a Royal Enfield motorcycle, but it's impossible for me to ignore this 1960s J.C. Higgins "Flightliner" bicycle for sale on CraigsList in Brighton, Mich. It's so — well, there is just something about it, isn't there? It's not quite right, but it's certainly not wrong. J.C. Higgins was a house brand for Sears department stores in the early 1960s. The bicycles were made by manufacturers of other brands, and rebadged. Pizazz was important to department store sales, so it came with shiny fenders and a long, narrow rack. Even the chain guard was shiny metal. A streamlined "tank" under the top bar typically held twin, battery powered headlights, not seen in this example. The antique automotive light is wrong but I like its dropped position. Instead, the seller has added an antique automotive headlamp (mounted on a bent and crimped bit of pipe). 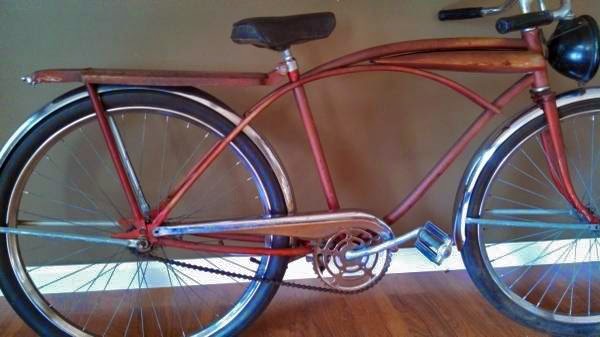 Together with the flipped handlebars, this light gives the bike the "rat rod" look the seller advertises. "Fifty years of patina can not be faked," he boasts. "Imagine riding this around the 'hood. You will not be overlooked." That's for sure. 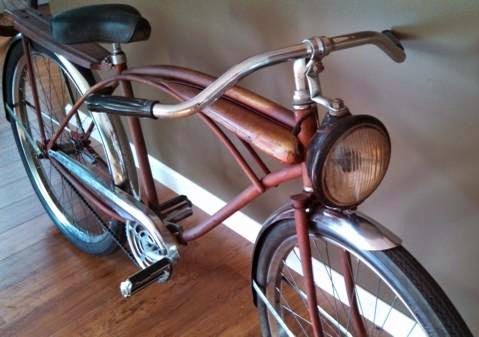 I don't like the automotive headlamp; it looks too old for this 1960s bicycle. But I do like the way the lamp is "dropped" below the handlebar level, where it lines up with the faux "tank." The long straight rack may be impractical but I love what it does to the lines. All-in-all, the lamp, tank and rack emphasize the horizontal lines of this bicycle that, from the side view, make it look racy indeed. The extremely tight fitting fenders complete its speedy appearance. I'm surprised how much I like it.